Objectives: To evaluate the impact of the physical exercise on circulating FGF21 level and the effect of chronic exercise time in normal people. Methods: A review was conducted according to the guidelines of the Preferred Reporting Items for Systematic Reviews and Meta-Analyses using the online databases PubMed, Science Direct, and EBSCO to identify relevant studies published through July 2016. Review Manager was used to estimate the effect of endurance exercise on the change of blood FGF21 concentration. Egger’s test was run to evaluate the funnel plot asymmetry. A smooth scatter diagram was used to determine the impact of exercise time on FGF21 level change. Results: Overall, five studies with a total of 260 participants indicated a decreased circulating FGF21 concentration after chronic exercise (-87.0 pg/ml, 95% CI: -119.2 to -54.7, p<0.01). Results of age subgroup analysis indicated the decreased FGF21 concentration was only occurred in young people (-86.4 pg/ml, 95% CI: -118.9 to -53.9, p<0.01), not in the middle age and old people (-82.43 pg/ml, 95% CI: -174.57 to -97.1, P=0.08). Ethnic subgroup analysis showed that FGF21 concentration was decreased in both Mongolian (-94.8 pg/ml, 95% CI: -167.2 to -22.5, p=0.01) and none Mongolian (-82.7 pg/ml, 95% CI: -116.2 to -49.3, p<0.00001). Conclusion: Current evidence demonstrates that chronic exercise significantly decreases circulating FGF21 level, and the reduction degree is increased with the extension of the exercise time. Fibroblast growth factor 21 (FGF21) belongs to the FGF family  and is abundantly expressed in the liver, skeletal muscle, pancreas and adipose tissue . FGF21 has been recently characterized as a hormone that regulates peripheral glucose tolerance and hepatic lipid metabolism . Hepatic FGF21 induction via PPARα  during long term fasting is required for the adaptive metabolic responses such as activation of Free Fatty Acid (FFA) oxidation, lipolysis and ketogenesis . Pharmacologic administration of FGF21 in obese rodents  or monkeys  improves insulin sensitivity, lowers both plasma glucose and triglyceride levels, and induces a small but significant weight loss. Furthermore, transgenic mice over-expressing FGF21 in the liver showed improvement in glycemic control and were resistant to dietinduced obesity . Therefore, FGF21 is thought to be as a potential molecular target or a therapeutic agent for the treatment of obesity and its associated metabolic disease. Exercise training has a favorable effect on various metabolic disorders such as obesity, type 2 diabetes and atherosclerosis . The effect of exercise training on circulating FGF21 has received remarkable attention recently, and a large body of published studies on related topics exists [10-19]. However, there is no consistent conclusion or consensus has been reached. The study by Ramos et al. pointed out daily physical activity was positively associated with an increased serum FGF21 level in healthy humans, and a two-week of supervised exercise caused a significant elevation of the serum FGF21 level . However, increasing evidence has noted that that exercise training decreased serum FGF21 level in both humans [13-15,19] and animal models . These contradictory findings raise great concerns about the relationship between chronic exercise training and changes in circulating FGF21. Furthermore, existing studies have varied considerably in the study characteristics, such as study design and exercise modes, and have utilized relatively small sample sizes, making their conclusions on the effects of chronic exercise training in altering FGF21 levels in peripheral blood less robust. The growing number of published studies on related topics allows researchers to conduct critical analysis using rigorous methods and to summarize the primary results. As such, this study was aimed at conducting separate metaanalyses of available literatures to evaluate the association between chronic exercise training and changes in circulating FGF21 levels among normal people, and to identify potential sources of heterogeneity and bias that may lead to inconsistencies in reported results. This study was also in an attempt to provide guidance for future study investigating the effects of endurance exercise training on circulating FGF21. This meta-analysis is reported in accordance with the Preferred Reporting Items for Systematic Reviews and Meta-Analyses (PRISMA)  statement. The systematic search was performed using PubMed, Web of Science, Springerlink, and EBSCO from January 2000 to July 2016. January 2000 was chosen as the starting date since FGF21 was not identified before 2000. The text words ‘FGF21’ and ‘AND’, with the text words ‘exercise’ or ‘training’ or ‘physical activity’ for the search. And further, we manually examined references of all received articles. Articles in the English language were eligible for inclusion provided that they fulfilled the following inclusion criteria: (1) were case-control studies conducted in the general or clinical population (trained or untrained) with more than five participants without any known disease; (2) was not an acute exercise training intervention (endurance exercise/ training); (3) compared with a control group in which participants were advised not to change their previous lifestyle (without regular exercise training), or between post- and pre-exercise when a control group was not applicable; (4) reported circulating (plasma/serum) FGF21 levels (the primary outcome); (5) were Randomized Controlled Trials (RCTs) or non-randomized controlled trials (NRSs). The types of NRSs design were determined according to the criteria in the Cochrane Handbook for Systematic Reviews of Interventions; and (6) samples in articles are normal (healthy and non-obese) people (Because disease or obesity affects circulating FGF21) [22-24]. Studies were excluded if they were reviews, cross-sectional studies, not involving humans, not in the English language, or the data of interest were insufficient and could not be provided by the corresponding authors. Posters were also excluded because of the limited information. A flow chart of the searching results was presented in Figure 1 and the information of each study is provided in Table 1. M: Exercise Mode; ET: Endurance Exercise Training; RT: Resistance Training; I: Exercise Intensity; T: Time Per Session (or Sets of Repetitions); F: Exercise Frequency; D: Exercise Duration (length of intervention). Table 1. Characteristics of the studies included in the meta-analysis. Each title and abstract was independently evaluated by two researchers for potential inclusion . Discrepancies were resolved by discussion or consensus. For each of the relevant studies, categories of variables were independently extracted by two authors: participant variables (study population, sample size, age, baseline Body Mass Index (BMI), exercise training variables (exercise mode, intensity, time extension per session, frequency and duration); and outcome variables (circulating FGF21 levels related to exercise training). A meta-analysis of continuous outcomes was conducted using Review Manager (RevMan software package version 5.3) and R software 3.3.0. Values were presented as means ± SD. For studies with reporting median and range, the equations of Hozo  were used to estimate mean and SD. Data from all included studies were used to calculate the weighted mean difference and 95% Confidence Interval (CI) using a continuous random effects model. Weighted percentages were based on the sample sizes of respective studies. Statistical significance was assumed to be P<0.05 in a Z-test analysis, which examined whether the effect size differed significantly from zero . Study heterogeneity was evaluated using the I2 statistic and Cochrane’s Q. Values of I2 greater than 50% and 75% were considered to indicate moderate and high heterogeneity, respectively . Significant heterogeneity was indicated when Cochrane’s Q exceeded the degrees of freedom (df) of the estimate. When meta-analysis was considered to indicate moderate-to-high heterogeneity and the random-effects model was used, publication bias was tested visually using a funnel plot. And we use R software 3.3.0 to carry out the egger’s test for rank correlation test of funnel plot asymmetry. The dose–response relationship between the exercise time and changes of FGF21 level in plasma or serum were determined using a smooth scatter diagram with the regression analysis. Figure 1 illustrated how the literatures were arranged. The initial search returned 184 abstracts, after duplicate studies (n=8), reviews, cross-sectional studies and posters (n=154) were excluded, 22 studies were assessed for their eligibility by applying the inclusion and exclusion criteria. As a result, another 16 studies were excluded, 7 studies with no FGF21 levels reported, 2 studies without detailed evaluation, and 6 studies with no endurance training reported, and in 1 study people’s BMI is more than 30 . Then, 6 studies are included in quantitative synthesis. After quantitative calculation, 1 study was excluded for it is the main source of heterogeneity . Ultimately, five studies met the specific criteria proposed for the present meta-analysis (Table 1) [10,13-15,18]. As shown in Table 1, among the 5 studies included, changes of circulating FGF21 concentrations in healthy untrained adults from baseline to post-exercise are determined in 3 studies [13,15,18]; circulating FGF21 levels are compared in subjects with and without training in 2 studies [10,14]. Both endurance and resistance training (20 min of muscle strength training per time and five times a week) are adopted in non-diabetic overweight women (BMI=27.6 ± 2.4) , only endurance training is carried out in healthy Japanese [13,18] or American [14,15]. The exercise intensities range from low to heavy. No major or minor adverse effects related to exercise training are reported. Circulating FGF21 concentrations in plasma or serum are determined by commercially available ELISA kits in all 5 studies. Subgroup analysis of age: Results of age subgroup analysis indicated that circulating FGF21 concentration was-86.4 pg/ml, (95% CI: -118.9 to -53.9) lower than control group (P<0.00001) in young people with no heterogeneity (I2 =0%; Cochrane’s Q=0.95, df=2, P=0.62) (Figure 2A). This means that in young people, FGF21 significantly reduced compared with the normal person who did not carry out endurance exercise. Whereas in the middle age and old people, we did not get meaningful data (-82.43 pg/ml, 95% CI: -174.57 to -97.1, P=0.08) with high heterogeneity (I2=78%; Cochrane’s Q=4.49, df=1, P=0.03) (Figure 2A). The shape of the funnel plot was prone to be symmetrical (Figure 3B), and the P value of the Egger’s test for rank correlation test of funnel plot asymmetry is 0.136, suggesting that there was no evidence of publication bias. Figure 2: Meta-analysis performed in the age and ethnic subgroups. The effects of endurance exercise on blood FGF21 concentration were demonstrated as the change from baseline to post exercise. Calculation based on random effects model. Results are expressed as Weighted Mean Difference (WMD) of FGF21 (pg/mL) and 95% Confidence Intervals (95% CI). Figure 3: A. Smooth scatter diagram showing the dose–response relationship between the mean volume and effect size changes of FGF21 plasma or serum for the included studies. B. Funnel plots analysis to detect publication bias. Each point represents an independent study. 3. Funnel plots analysis to detect publication bias. Each point represents an independent study. Subsequently, five studies involving 142 healthy participants were pooled to evaluate the effects of endurance exercise training on circulating FGF21 levels compared with the 118 matched control participants. As shown in Figure 2, the combined results showed a significant decreased circulating FGF21 concentration, as indicated by the mean effect size of -87.0 pg/ml (95% CI: -119.2 to -54.7, p<0.00001) with low heterogeneity (I2=27%; Cochrane’s Q=5.45, df=4, p=0.22). 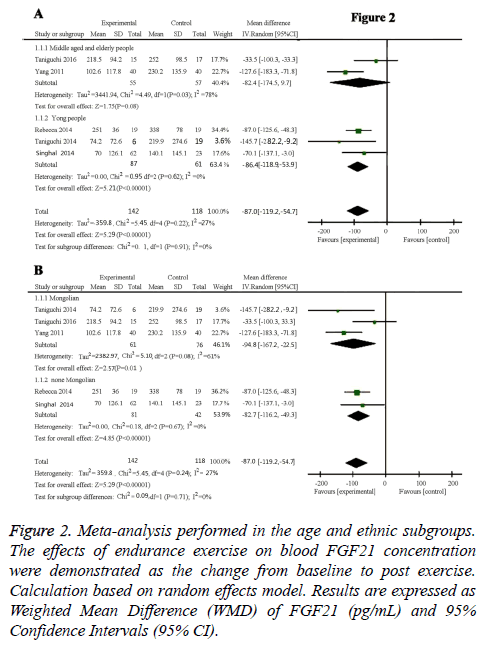 As demonstrated in Figure 2B, endurance exercise training significantly decrease circulating FGF21 levels in both Mongolian (Korean and Japanese) and none Mongolian (American) groups. The circulating FGF21 concentration was -94.8 pg/ml (95% CI: -167.2~-22.5, P=0.01) in Mongolian race with moderate heterogeneity (I2=61%; Cochrane’s Q=5.1, df=2, P=0.08), and -82.79 pg/ml (95% CI: -116.27~-49.32, P<0.00001) in none Mongolian race with no heterogeneity (I2=0%; Cochrane’s Q=0.18, df=1, P=0.67). There is no significant difference between Mongolian and none Mongolian races (P=0.71). Funnel plot inspection demonstrated symmetric distribution (Figure 3C) and an absence of publication bias with a P value of 0.136 in the Egger’s test for funnel plot asymmetry. To inspect the effect of endurance exercise time on FGF21 levels, we analysed the dose-response relationship between the mean volume and change of circulating FGF21 concentration by using regression analysis. Three studies providing specific exercise type and time were included [10,14,18]. As displayed in Figure 3A, the smooth scatter diagram showed a reduction trend of FGF21 levels with the extension of the exercise time. It has been reported in large body of literatures that physical exercise can increase insulin sensitivity and promote lipid catabolism, resulting in decreased plasma levels of insulin and triglyceride [28-31]. And FGF21 also has the same physical function [32-35]. So logically, after chronic endurance exercise, insulin sensitivity increases, it does not require so much FGF21 to promote insulin sensitivity, and therefore the level of FGF21 will decline. Three studies included in the article also observed that the levels of serum insulin and blood glucose in the endurance exercise group were decreased compared to the control group [10,13,18], which are agreement with the explanation of the reasons for the decline of FGF21 level. Besides, FGF21 in peripheral blood mainly comes from liver , and exercise can increase the expression of FGF21 receptor beta-Klotho in rat liver [37,38]. FGF21 and its receptor bind to form a stable FGF21/ beta Klotho/FGFR complex, which can enhance the expression of PGC-1alpha in liver tissue . However, PGC-1alpha is a negative regulator of FGF21 . Therefore, logically, FGF21 levels will decrease after chronic exercise. Our present meta-analysis provides evidence that more than 3 weeks chronic endurance exercise training (We get this time point because the exercise time is over three weeks in all the included trials) had a significant effect on decreasing circulating FGF21 levels in normal people (-87.0 pg/ml, P<0.00001) (Figures 2 and 3). However, the difference of FGF21 only in young people group before and after exercise is significant (-86.4 pg/ml, P<0.0001), while result in the middle aged and elderly group is not significant (-82.43 pg/ml, P=0.08). The reason we speculate is that young people have good physique, the body's self-regulation ability is better than the middle aged and elderly persons, so they can rapidly regulate the level of FGF21, so the difference is significant. While middle aged and old people's physiques were not so good, they have lost some of the ability for self-regulation of fat and sugar metabolism, they cannot regulate the level of FGF21 rapidly, so the difference is not significant. As the difference is not significant in the middle and old age groups, it is not able to analyse the difference between the young group and the elderly. To further analyse the changes of FGF21 before and after the movement between young and middle aged and elderly people, we need more support from the literature. The results of the ethnic subgroup analysis showed that there was a significant change in the FGF21 level in both Mongolia and non-Mongolia races. This suggests that racial differences may not affect the relationship between endurance exercise and circulating FGF21 levels. In addition, through the regression analysis of the data, we also found that with the increase of endurance exercise time, the degree of FGF21 level decreased, this shows that endurance exercise time can also affect the level of FGF21 changes. So far, this is the first comprehensive analysis to systematically evaluate the impact of chronic endurance exercise on circulating FGF21 level. The methodology of this study was registered a priori, which minimises the reporting bias. We have to acknowledge that the study also has several inadequacies. First, the relatively small number of studies limited our ability to fully understand the effects of chronic exercise training on circulating FGF21 level, such as combined chronic endurance and resistance exercise training effects. The second, the relatively literature content is not rich enough and limited our ability to identify potential moderator variables associated with the changes in circulating FGF21, such as insulin sensitivity/resistance index and body fat percentage. If we have a more detailed data, maybe we can study further the effects of exercise on insulin and speculate how exercises affect circulating FGF21 through insulin. Besides, the document type is not various enough. There is only one article that can be incorporated into the RCTs model, which is more meaningful than the NRSs model, because NRSs has more potential of bias than the RCTs. Finally, the mechanism of a phenomenon is usually not single (including FGF21 changes after exercise), which are involved in many different factors, leading to contradictory results. Different mechanism can be working between cases with elevated FGF21 after exercise and cases with decreased FGF21. For example, exercises activate KLOTHO increasing FGF21 expression [37,38]. Other mechanism will cause the loss of FGF21, such as mechanisms mentioned above. More careful study on clinical characteristics or exercises (mode, intensity, time and so on) between FGF21- increasing cases (studies) and FGF21-decreasing cases (studies) may lead to identifying another factor determining increasing or decreasing of FGF21 after exercise. The present meta-analysis showed that chronic exercise training was associated with decreased circulating FGF21 levels, and the reduction degree was increased with the extension of exercise time. To further confirm and explain these findings, more well-designed randomized controlled trials utilizing different exercise training modes, document dietary or energy intake, and describe potential weight loss or insulin sensitivity/resistance index following chronic exercise training are required. This study was provided by the National High-tech R & D Program of China (863 Program 2014AA021604), Sichuan Province Science and Technology Support Program (Grant 2015SZ0140), and National Natural Science Foundation of China (Grant 31071108). Itoh N. Hormone-like (endocrine) Fgfs: their evolutionary history and roles in development, metabolism, and disease. Cell Tissue Res 2010; 342: 1-11. Yaylaoglu MB. Comprehensive expression atlas of fibroblast growth factors and their receptors generated by a novel robotic in situ hybridization platform. Dev Dyn 2005; 234: 371-386. Kharitonenkov A, Shiyanova TL, Koester A, Ford AM, Micanovic R. FGF-21 as a novel metabolic regulator. J Clin Invest 2005; 115: 1627-1635. Badman MK. Hepatic fibroblast growth factor 21 is regulated by PPARalpha and is a key mediator of hepatic lipid metabolism in ketotic states. Cell Metab 2007; 5: 426-437. Kurosu H. Tissue-specific expression of betaKlotho and fibroblast growth factor (FGF) receptor isoforms determines metabolic activity of FGF19 and FGF21. J Biol Chem 2007; 282: 26687-26695. Coskun T, Bina HA, Schneider MA, Dunbar JD, Hu CC. Fibroblast growth factor 21 corrects obesity in mice. Endocrinology 2008; 149: 6018-6027. Kharitonenkov A, Wroblewski VJ, Koester A, Chen YF, Clutinger CK. The metabolic state of diabetic monkeys is regulated by fibroblast growth factor-21. Endocrinology 2007; 148: 774-781. Hale C, Chen MM, Stanislaus S, Chinookoswong N, Hager T. Lack of overt FGF21 resistance in two mouse models of obesity and insulin resistance. Endocrinology 2012; 153: 69-80. Booth FW, Ruegsegger GN, Toedebusch RG, Yan Z. Endurance exercise and the regulation of skeletal muscle metabolism. Prog Mol Biol Transl Sci 2015; 135: 129-151. Yang SJ. Effects of a three-month combined exercise programme on fibroblast growth factor 21 and fetuin-A levels and arterial stiffness in obese women. Clin Endocrinol (Oxf) 2011; 75: 464-469. Cuevas-Ramos D, Almeda-Valdes P, Meza-Arana CE, Brito-Cordova G, Gomez-Perez FJ. Exercise increases serum fibroblast growth factor 21 (FGF21) levels. PLoS One 2012; 7: 38022. Kim KH, Kim SH, Min YK, Yang HM, Lee JB. Acute exercise induces FGF21 expression in mice and in healthy humans. PLoS One 2013; 8: 63517. Taniguchi H, Tanisawa K, Sun X, Cao ZB, Oshima S. Cardiorespiratory fitness and visceral fat are key determinants of serum fibroblast growth factor 21 concentration in Japanese men. J Clin Endocrinol Metab 2014; 99: 1877-1884. Singhal V. Irisin levels are lower in young amenorrheic athletes compared with eumenorrheic athletes and non-athletes and are associated with bone density and strength estimates. PLoS One 2014; 9: 100218. Scalzo RL. Regulators of human white adipose browning: evidence for sympathetic control and sexual dimorphic responses to sprint interval training. PLoS One 2014; 9: 90696. Besse-Patin A, Montastier E, Vinel C, Castan-Laurell I, Louche K. Effect of endurance training on skeletal muscle myokine expression in obese men: identification of apelin as a novel myokine. Int J Obes (Lond) 2014; 38: 707-713. Alfieri A. Effects of long-term football training on the expression profile of genes involved in muscle oxidative metabolism. Mol Cell Probes 2015; 29: 43-47. Taniguchi H, Tanisawa K, Sun X, Kubo T, Higuchi M. Endurance exercise reduces hepatic fat content and serum fibroblast growth factor 21 levels in elderly men. J Clin Endocrinol Metab 2016; 101: 191-198. Taniguchi H, Tanisawa K. Acute endurance exercise lowers serum fibroblast growth factor 21 levels in Japanese men. Clin Endocrinol (Oxf) 2016; 85: 861-867. Petri I. Effect of exercise on photoperiod-regulated hypothalamic gene expression and peripheral hormones in the seasonal Dwarf Hamster Phodopus sungorus. PLoS One 2014; 9: 90253. Moher D, Liberati A, Tetzlaff J, Altman DG, PRISMA Group. Preferred reporting items for systematic reviews and meta-analyses: the PRISMA statement. Ann Intern Med 2009; 151: 264-269. Zhang X, Yeung DC, Karpisek M, Stejskal D, Zhou ZG. Serum FGF21 levels are increased in obesity and are independently associated with the metabolic syndrome in humans. Diabetes 2008; 57: 1246-1253. Lips MA, de Groot GH, Berends FJ, Wiezer R, van Wagensveld BA. Calorie restriction and Roux-en-Y gastric bypass have opposing effects on circulating FGF21 in morbidly obese subjects. Clin Endocrinol (Oxf) 2014; 81: 862-870. Reinehr T, Karges B, Meissner T, Wiegand S, Stoffel-Wagner B. Inflammatory markers in obese adolescents with type 2 diabetes and their relationship to hepatokines and adipokines. J Pediatr 2016; 173: 131-135. Higgins JPTS. Green, and Cochrane Collaboration., Cochrane handbook for systematic reviews of interventions. Cochrane Book Series Chichester England Hoboken NJ Wiley-Blackwell 2008; 649. Hozo SP, Djulbegovic B, Hozo I. Estimating the mean and variance from the median, range, and the size of a sample. BMC Med Res Methodol 2005; 5: 13. Higgins JP, Thompson SG, Deeks JJ, Altman DG. Measuring inconsistency in meta-analyses. BMJ 2003; 327: 557-560. Shepherd SO. Sprint interval and traditional endurance training increase net intramuscular triglyceride breakdown and expression of perilipin 2 and 5. J Physiol 2013; 591: 657-675. Emami SR. Impact of eight weeks endurance training on biochemical parameters and obesity-induced oxidative stress in high fat diet-fed rats. J Exerc Nutrition Biochem 2016; 20: 29-35. Bergman BC. Increased intramuscular lipid synthesis and low saturation relate to insulin sensitivity in endurance-trained athletes. J Appl Physiol 2010; 108: 1134-1141. Ghahramanloo E, Midgley AW, Bentley DJ. The effect of concurrent training on blood lipid profile and anthropometrical characteristics of previously untrained men. J Phys Act Health 2009; 6: 760-766. Lin Z, Tian H, Lam KS, Lin S, Hoo RC. Adiponectin mediates the metabolic effects of FGF21 on glucose homeostasis and insulin sensitivity in mice. Cell Metab 2013; 17: 779-789. Fisher FM, Estall JL, Adams AC, Antonellis PJ, Bina HA. Integrated regulation of hepatic metabolism by fibroblast growth factor 21 (FGF21) in vivo. Endocrinology 2011; 152: 2996-3004. Badman MK, Koester A, Flier JS, Kharitonenkov A, Maratos-Flier E. Fibroblast growth factor 21-deficient mice demonstrate impaired adaptation to ketosis. Endocrinology 2009; 150: 4931-4940. Adams AC, Halstead CA, Hansen BC, Irizarry AR, Martin JA. LY2405319, an engineered FGF21 variant, improves the metabolic status of diabetic monkeys. PLoS One 2013; 8: 65763. Markan KR, Naber MC, Ameka MK, Anderegg MD, Mangelsdorf DJ. Circulating FGF21 is liver derived and enhances glucose uptake during refeeding and overfeeding. Diabetes 2014; 63: 4057-4063. Fletcher JA. Fibroblast growth factor 21 and exercise-induced hepatic mitochondrial adaptations. Am J Physiol Gastrointest Liver Physiol 2016; 310: 832-843. Fisher FM, Chui PC, Antonellis PJ, Bina HA, Kharitonenkov A. Obesity is a fibroblast growth factor 21 (FGF21)-resistant state. Diabetes 2010; 59: 2781-2789. Yie J, Hecht R, Patel J, Stevens J, Wang W. FGF21 N- and C-termini play different roles in receptor interaction and activation. FEBS Lett 2009; 583: 19-24. Estall JL, Ruas JL, Choi CS, Laznik D, Badman M. PGC-1alpha negatively regulates hepatic FGF21 expression by modulating the heme/Rev-Erb(alpha) axis. Proc Natl Acad Sci USA 2009; 106: 22510-22515.